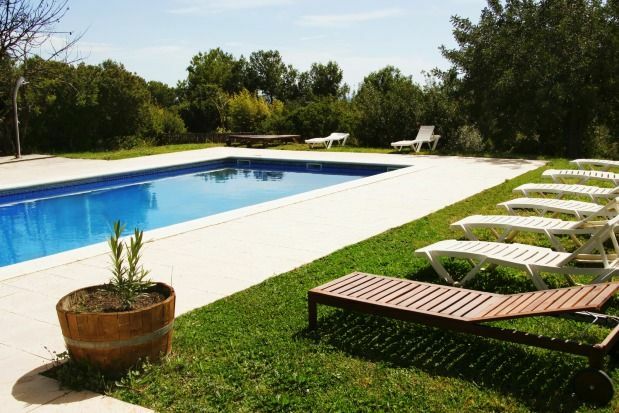 Discover Can Ramonet, rural house with history (15 rooms, 30 people). Can Ramonet is a cozy Masia from the 16th century located in the framework of the Garraf Natural Park, located 35 km from Barcelona, 5 km from Sitges and 25 km from El Prat airport, with 15 rooms with capacity for 30 people * (beds are allowed) additional). The rooms and spaces of the farmhouse are distributed in three buildings that make up a small nucleus with patios, interior squares and gardens, surrounded by beautiful meadows and vineyards with more than 1 hectare of landscaped land and forest. In addition, Can Ramonet has a year-round outdoor pool, free Wi-Fi and a 24-hour reception. A unique, inspiring, relaxing and natural environment ideal for celebrations, weddings, business meetings and stays of large families and friends. We have different spaces ideal for group stays or for different families that want to get together in a rural getaway. The different buildings have rooms and suites equipped with private bathroom and common spaces with TV and fireplace. In addition, we have complete kitchens that include oven, dishwasher and common appliances, as well as a barbecue that can be used in covered. Can Ramonet offers an inspirational environment ideal for meetings and outings of companies, away from the natural working environment, which allows to disconnect from the routine and generate dynamics of teamwork. We have different diaphanous rooms with all the necessary material for holding workshops, company events, training and teambuilding. We also have a local cuisine, exclusive, creative and customizable according to the type of event, moldable spaces with all the necessary equipment, as well as a wide range of teambulding activities and work sessions that can be complemented with your proposal. The celebrations at Can Ramonet are designed especially for weekend weddings. Thanks to its exterior and interior spaces, as well as its different rooms, the farmhouse extends the celebration to different days. In Can Ramonet you can live your celebration in this hidden little treasure, with a unique environment, ruraly respectful with the environment, in addition to enjoying a gastronomic experience based on local products and quality. Nosaltres hem passat un cap de setmana increible a Can Ramonet, per a una reunió d'amics i família en motiu d'un aniversari. Ens vam allotjar 20 persones, a les cases Ca l'Erika i Can Marius. Es tracta d'una construcció rural molt gran, amb amplis espais a la piscina i varies zones exteriors. Ideal per a l'estiu i per jugar amb nens, o per fer el vermut al sol. Vam fer una calçotada a la barbacoa, cuines ben equipades. Can Ramonet es un excelente sitio donde pasamos 3 días inolvidables. Somos varios amigos venidos de diferentes lugares de Europa ( Barcelona, Saint Etienne, Toulouse, Amsterdam y Dusseldorf) decidimos reunirnos en Ca l'Erika, Ca la Mei et Ca Marius para celebrar mi cumpleaños. Adultos y pequeños disfrutamos de la casa y su entorno asi como de la fantástica piscina. Todo el mundo quedó encantado con el lugar y las prestaciones. Todo muy limpio y cuidado. Las habitaciones amplias i cómodas. Los espacios comunes están muy agradable. El servicio fue INMEJORABLE!!!! Quiero dar las gracias a Mónica por estar pendientes de nosotros en todo momento, siempre con una sonrisa y que contribuyera a crear un ambiente perfecto! Altamente recomendable, es el lugar IDEAL para organizar cualquier tipo de celebración. Hemos pasado el fin de semana de San Juan un grupo de amigos con niños ocupando al completo la casa Ca l’Erika. Estado absoluto de dejadez tanto en el interior de la casa como en el exterior. El agua de la piscina de color verde y las luces de las terrazas del exterior sin funcionar. Sin duda, los protagonistas de nuestra estancia los mosquitos, las moscas y no quiero ni pensar en otros insectos después de ver las picaduras de los niños. Eramos dos adultos, que no pudimos pegar ojo, una niña de 4 años y un bebé de 16 meses. Mucha calor (que óbviamente aceptamos) y muchos mosquitos en la habitación (no había ni una sola mosquitera en las ventanas). Nos levantamos a la mañana siguiente todos llenos de picaduras, yo llegué a notar un fuerte escozor en una pierna a lo largo de la noche. A la mañana siguiente, en una sola pierna de mi bebé contabilizamos hasta 24 picaduras. Al principio pensábamos que las picaduras del bebé eran de mosquitos, dado que eran muy numerosos y que llegamos a matar unos cuantos antes de apagar luces pero, tras visitar al pediatra, nos aseguró que eran picaduras de pulgas.